Sketch Engine can handle parallel corpora and multilingual corpora to compare different languages or to look up translation examples. Why parallel and multilingual corpora? Parallel and multilingual corpora can be used by translators to look up how other translators have already translated a word or phrase but also by linguists to look into the behaviour of the same phrase or word in different languages. How search a parallel / multilingual corpus? A parallel corpus in Sketch Engine consists of as many monolingual corpora as there are languages in the corpus. 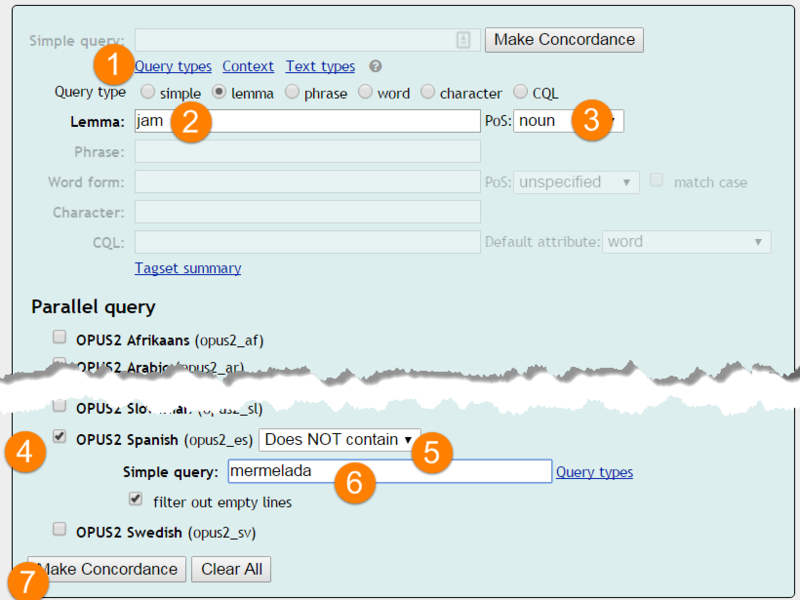 Searching and the available options are the same as with monolingual concordance search. The difference is that you can also specify search criteria for the second language. For example: find all sentences in English where jam is NOT translated as mermelada into Spanish. Sketch Engine will display the results next to each other aligned (usually) at sentence level, i.e. the matching sentences will be displayed next to each other. The search word will be highlighted in the first language and translation candidates will be highlighted in the second language. View options in the left menu are identical to the view options of a standard concordance. Sort, filter and frequency will only be applied to the first language. Alignment changes the way the aligned structures (usually sentences) are displayed. It switches between a KWIC display and the whole sentences.